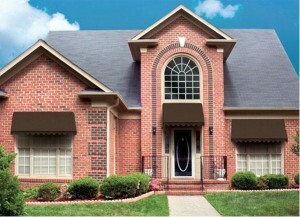 Add some major curb appeal to your home with new awnings! Whether you are planning to sell your home soon or just looking to spruce up the exterior appearance, awnings are a fantastic practical way to do so. When it comes time to add some major curb appeal to your home, choose awnings! Here are some of the many reasons why they are the perfect option for your home. While the inside can be more important, the outside of your home is the entire first impression that potential buyers will get when they drive or walk by. If you can’t attract buyers with the outside of the home, they may never even call or show up at an open house to see the inside. Curb appeal makes all of the difference! Instead of spending a ton of time focused on your shades, curtains, blinds, and draperies, focus on the outside and install awnings. Many people have outdated ideas of what awnings can be constructed from and how much they cost. Today’s awnings are an incredibly affordable option to add curb appeal to your home and offer you many practical benefits. Awnings can be made of wood, metal, vinyl, or other combinations of building materials. If you want to install awnings and are concerned about algae or decay, there are still multiple materials available to suit your needs. Whether or not you are planning on selling your home, you will enjoy the major cost savings associated with installing awnings. Awnings can be designed specifically to prevent your home from bearing the worst of the damage during weather events and protect your windows. As a result, the frames themselves and the windows will stay in better condition and need to be replaced less often. Beyond window savings, awnings help to keep excess sun out of your home during the warm summer months. You won’t need to run the air conditioning as often (or squint from the bright sunlight).